The Call Data Records (CDR) contain information about calls collected from the IPitomy IP PBX for a specified period of time. The report details the number of calls, call duration, call origination, call destination, and status. Call Data Records (CDR) can be sorted by specific time periods. CDR may also be exported in the same date range format. The records have also been enhanced for easier reading, and comprehension of data. To sort simply select the date range you wish to be displayed, and then press the view button. The display will be arranged and sorted according to your date selections. Date/Time The date and time of the call. Outgoing: An internal entity made a call out a trunk. Incoming: An external party made a call inbound over a trunk. Source The originating party for the call. Destination The end location for the call. Trunk Defines which trunk was used for the call. Duration The length of the call in hours:minutes:seconds. Adandoned: Call entered a Queue, but the caller hung up before the call was answered or met the failover requirement. ChanUnavail: No channel was able to be created for the call due to a possible error state for the intended destination. Agent Completed: Connected Queue call was terminated at the extension. Hangup: Call to a Menu, but the caller hung up before taking any actions. Caller Completed: Connected Queue call was terminated at the calling parties end. Cancel: Call from an Extension, but the caller hangs up before the call is connected. No Answer: A call that met the ring time of an extension without being answered. Timeout Exit: Call to a Queue that meets the Timeout. VM Not Left: Call ended with the caller being sent to voicemail where they did not leave a message. VM Left: Call ended with the caller being sent to voicemail where they left a message. Transferred: Connected call successfully transferred. Congestion: Call out a trunk returned busy status, or extension was busy. Note: Defines the call is still active, and the status will update when completed. Click on the call record for details. Exited Empty Queue: Call to Queue that follows Exit Empty rule. IPitomy PBX Software version 3.4.1 and above have the added ability to view CDR Reports and Queue data from Smart Personal Console (SPC) using a special user name and password. Locate to the General Settings section (second section from the top). It may be helpful to change this to a user-friendly password. If you change the password be sure to and Apply Changes . 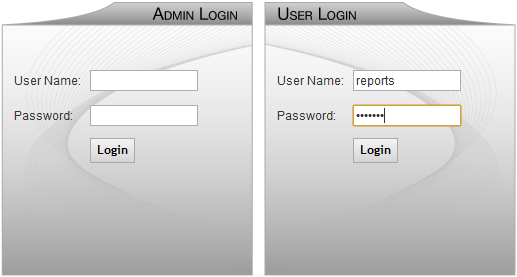 Using the right sideSmart Personal Console (User Login) input the word “reports” as the user name and the password that you noted previously. Click on Queue Graphs to open that interface and use the instructions below to extract that data. From the Reporting=>Reports page, click on the CDR Report button. The CDR Report page appears. Select the From and To date range by click on the box next to the From and To fields. Use the calendar control page that appears to select the desired dates. Click the View button. A report with call information from the date range parameter that was entered is displayed. 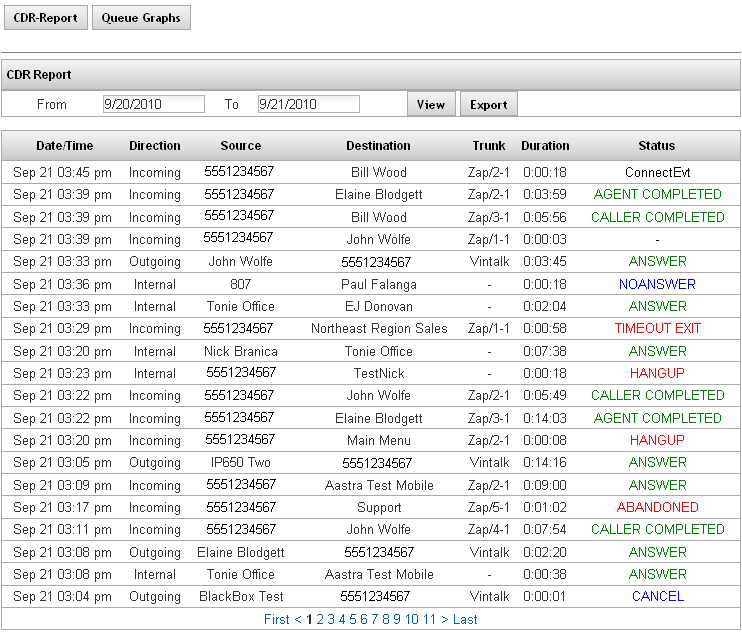 Click on an individual call record and a new window will appear displaying more detailed information for that call. The Export function will provide you with a tabulated report to download to a PC. From the Reporting=>'Reports page, click on the CDR Report' button. The CDR Report page appears. Enter the date range and retrieve the report that you want to export (see steps for Viewing Report). Click the Export button then specify the location where you want to download the report. where A1 contains the UNIX time should convert to Excel date/time. A1 is the cell designation. Once you enter this formula in one cell, be sure to format the cell to Custom: date:h:m:s, and you will see the date and time. Then you can mouse over the bottom right corner of the cell and a bold + will display, click and drag down, and the cell data will be copied down the column, updating the cell number to reflect appropriately. Queue Graphs display additional call information for ACD Queues. A PBX must be licensed for ACD for this button to appear. This is the listing of the queue you want to view. The drop-down list is populated with the various groups that have been configured. This allows you to specify a range of dates for which call records will display. This allows you to specify a start and end time within the date range for the reporting to display. This is the increment with which to sort by. The default increment is 2 hour. Move the slider to adjust the size of the graph to meet your viewing requirements. From the Reporting=>Reports page, click on the Queue Graphs button. The Queue Graphs page appears. Select the Queue Type from the drop-down list. Select the Start and End date using the calendar control that appears when you click on the date fields. Select the desired Start and End time for the reporting period you want to search. Change the Sorting parameters to the desired setting. Click the Update button. The system will perform the search based on the criteria that is specified and display the results. The Overview Tab offers an overall summary of the calls for the period in question for that queue. The overview will display textual information for answered and unanswered calls, as well as a graph summarizing the information. Total number of calls answered, or unanswered. An average of the wait time for calls answered, or unanswered. Shortest wait time for calls answered, or unanswered. Longest wait time for calls answered, or unanswered. Average duration of an answered call. Shortest duration of an answered call. Longest duration of an answered call. The Agents tab displays details for queue members. Time spent on queue calls. Number of calls displayed in parenthesis. Time spent on inbound, non-queue calls. Number of calls displayed in parenthesis. Time spent on outbound, non-queue calls. Number of calls displayed in parenthesis. Time spent on internal, non-queue calls. Number of calls displayed in parenthesis. Time spent paused out of the queue. Number of calls displayed in parenthesis. 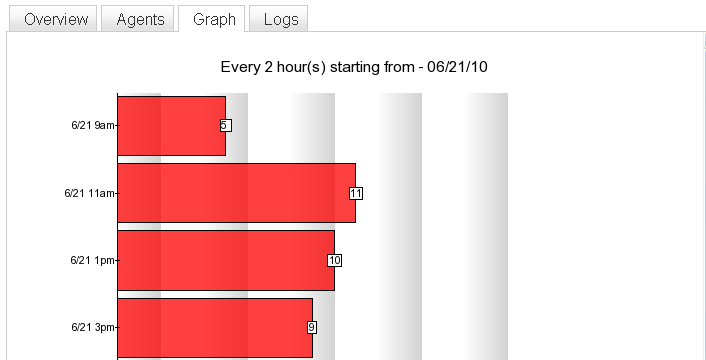 The Graph Tab provides a graphical view of queue calls only. Inbound and outbound calls are tabulated but not graphed. The graph tab divided into time segments defined by the Sorting setting set previously. 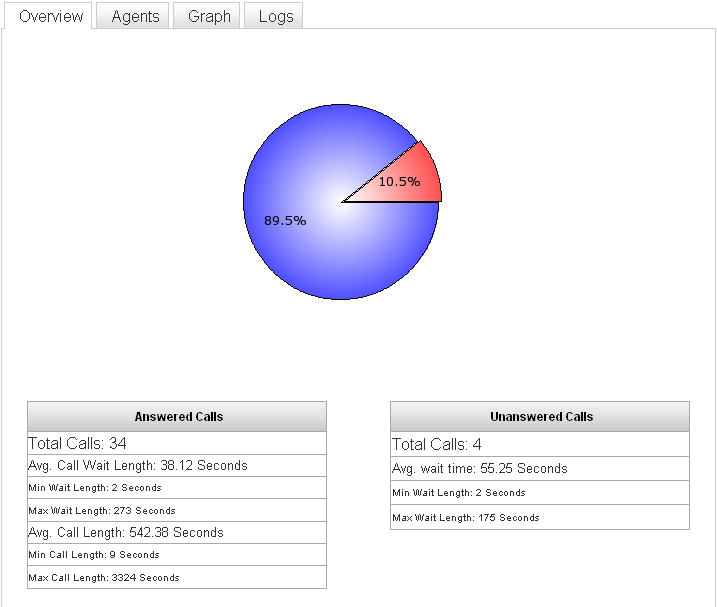 The information presented in this tab will allow you to determine busiest times and when call coverage is most needed. 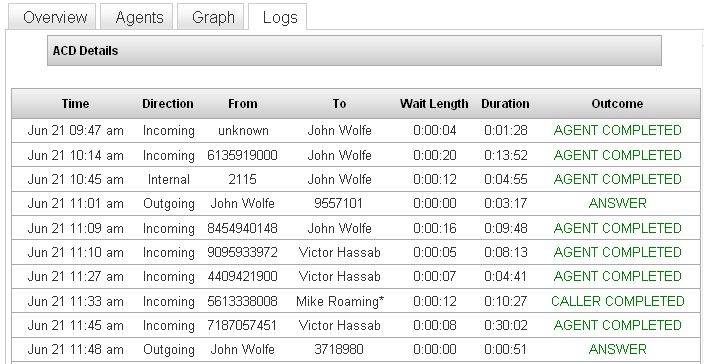 The Logs Tab will display the complete call log for the queue from your search setting. It will display the time of the call, the direction of the call either inbound or outbound, the caller ID that was delivered with the call, the location that the call was delivered to, the wait time for the caller, the total duration of the call, and finally the outcome of the call or the final status of the call. See the table for CDR Report Descriptions for detailed information about the fields.